place, because I reach for them so frequently — always a sure bet for calm, untroubled listening and de-stressing at the end of a hard day. 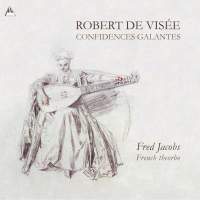 One of these is a programme of lute music by the seventeenth-century French composer Robert de Visée played by the Dutch lutenist Fred Jacobs. 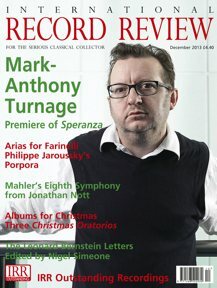 I took such pleasure reviewing it back in September 2008 that it’s just never been put away. So when I saw that Jacobs had produced a companion volume, I couldn’t wait to get my hands on it. The other musicians who joined de Visée in ‘La Chambre du Roy’ (and who influenced his own music) are fairly well known today: François Couperin played the harpsichord, Antoine Forqueray the viol and Jean-Féry Rebel was a celebrated violinist. But de Visée has rather slipped through the net. The problem is that when he published his works in 1716 , lute tablature, and the very instrument itself, were going out of fashion, so he thought it would make more commercial sense to offer the public versions of his music simply scored for a melody instrument and continuo. The manuscripts which preserve de Visée’s works in their original form survive somewhat patchily, which has been the major stumbling block to his modem revival, plus the question of exactly what kind of instrument he actually played his music on. One of the first things that strikes me in the opening tracks of this new recording is the extraordinary richness of the instrument which Jacobs plays: It belongs to a species known as the ‘ theorbo ‘ , which means that it’s a lute with a long neck designed to support eight low bass strings (each playing a single note) — which is what gives the theorbo its tremendous depth of sound. But French theorbos had a secret ingredient which made them even more sonorous. Great lovers of the sixteenth-century Italian bass lute, which was especially resonant, French theorbo makers cannibalized their bodies and then attached new necks to them, long enough to support the sympathetic bass strings. Or so we surmise — no French theorbos actually survive . . . though there’s enough iconographical and documentary evidence to have a go at building one afresh. Michael Lowe’s speculative instrument was made for Jacobs in 2004 for his Channel Classics recording ‘L’Esprit Galant’ (I reviewed it in January 2008) and it has been getting better with age . Here it sounds more articulate than ever, with greater tonal focus and tighter, better-controlled bass. So, it seems that de Visée’s pieces were specifically designed for this kind of French super-lute, which had almost the compass of a harpsichord but was much more subtle to the touch. In de Visée’s lute transcriptions of two harpsichord pieces by his royal colleague François Couperin, Jacobs is able to apply the kind of touch-sensitivity which harpsichordists today can only dream about. Because he can control his dynamics and attack, he is able to shape the music in ways which are impossible on a harpsichord, but from which harpsichordists could learn a lot about phrasing, articulation and gesture. Jacobs has chosen four expansive suites by de Visée, three of them in minor keys, setting an overall mood which is both more serious, and the music more substantial, than in Jacobs’s first de Visée disc. The short Prelude from the B minor Suite would be nothing without Jacobs’s supernatural rhetorical instincts for shaping the music, his understanding of the gestures, and just exactly how they should be weighted. It’s like the courtly conventions for bowing to your social superiors, in which apparently minor details made all the difference : how fast the movement should be up and down, how deep, how humble, and how should the right wrist bend, etc. If this little Prelude had been placed at the start of the disc the sheer subtlety of Jacobs’s nuances would have come upon us too soon. But we are given a whole, accessible suite first to help us acclimatize. As with everything on this recording, the placing, balance and weighting of every movement have been considered with courtly meticulousness. After the Prelude comes an Allemande of deep gravitas, its rising and sighing phrases caressed, coaxed and even compelled from the instrument — and making much of the resonance of the deep bass strings. Throughout, Jacobs creates a real sense of majesty, with spacious phrasing, sweeping bows and an absolute conviction that this music is worthy of the Sun King. On the lighter side we have dances like the Gigue anglois from the G minor Suite. I warm to its slightly square-toed melodic gait — perhaps de Visée was hinting that the English were a little less light on their feet than the French. Nevertheless, it’s still rather dashing. Mention must also be made of the sympathetic and naturally balanced recording, a model of its kind, which offers both intimacy and enough space around the instrument to let it really speak, even sing ... frequently accompanied by quite long stretches of birdsong. The title of this disc, ‘Confidences Galantes’, suggests that de Visée’s confidential and refined art was a private pleasure, a refuge from the hurly-burly of everyday life, to be enjoyed in homely, intimate surroundings. I can’t recommend it highly enough, not only for its stress -reducing , calm-inducing properties but above all for the ravishing quality of the music itself, the magnificent instrument it’s played upon and the outstanding artistry of Fred Jacobs, who is not merely technically compelling but displays a deep understanding for, and profound empathy with, de Visée, and the French Baroque. There’s simply no one else playing the French repertory to this standard — and it’s a gold standard.